Sunday was a lazy family day but we popped out for a Sunday Stroll and got some shopping from the brand new Aldi opened round the corner, this is Daddy and Elizabeth with their backpacks full of shopping! After work today I joined my lovely friends and fellow bloggers Pippa from Red Rose Mummy and Steph from Seeing Spots for a bite to eat followed by #CAfashion14, a lovely networking evening hosted by Country Attire. The weather has been interesting of late so I decided to treat myself to some new Wellies! I was thrilled to find these Joules ones on sale for just £18 in Office! Just in time for the Snowfall we had today! Ben was very excited to get his first Beaver badges today! We had lots of bathtime fun before bedtime today check out our full post here. Today was Valentines day, because of work and other commitments, myself and hubby only got to see each other for about an hour, but he did bring me these lovely tulips. Elizabeth had a substitute teacher for Baby Ballet this morning which meant the lesson was rather different from usual, she really took to it, getting into all the dances and becoming a bit giddy at the end of the class. This is her rolling on the floor after getting her Mini Movers certificate! Love his face with his new badges! I so need to get myself some wellies too! Love the foamy bath face photo! I love the bubble beards! Haha! It's never good to have leaking willies! 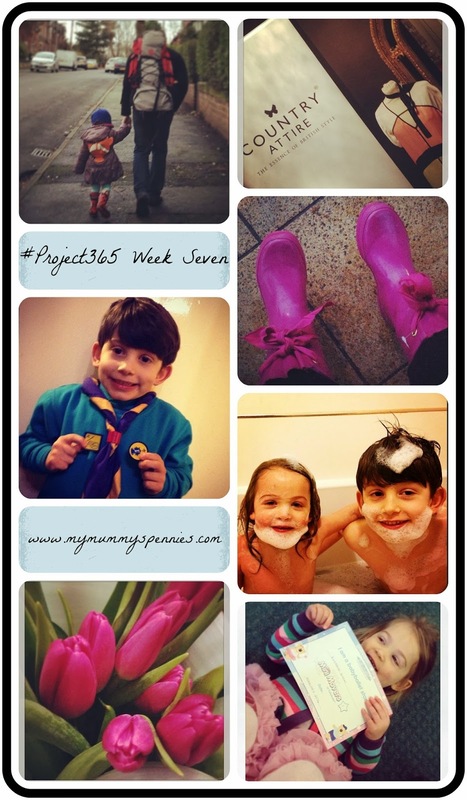 Lovely photo's from the week, I am rather jealous of the wellies bargain. I am in desperate need of new wellies! Loving your pink wellies! Those tulips are pretty lovely too and look how proud the kiddies are to get badges and a certificate! Love the wellies - think i need some of those! those wellies look outrageously fantastic!! Gorgeous shots - what a great week. Love the tulips and the wellies and the certificate rolling on the floor! I look forward to sewing on badges for my 2 in due course! Love the wellies. Glad you went back for them! Lovely to see you on Monday. The bath time fun picture is brilliant!